Welcome to Viridian Water Systems! Viridian Water Systems is an Industrial Water Treatment Company specializing in Water Deionization Systems. Our staff is equipped with more than 25 years of experience in delivering, installing and commissioning all types of Water Treatment Solutions to the industry. This includes Water Deionization Systems, Industrial Reverse Osmosis Systems, Industrial Water Softeners, UV Systems (Ultraviolet Disinfection Systems), Carbon Filters, Iron/Sulphur Filters and Automated Storage Solutions. 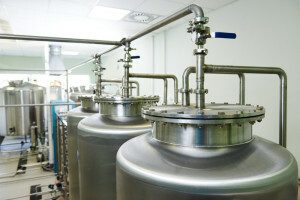 Deionized Water is critical to many industries and across many business sectors. Water Deionization Systems are essential for numerous Industrial processes such as manufacturing, bottling plants, metal finishing, beverage production and cosmetic & pharmaceutical production. Viridian Water Systems is proud to supply the industry with quality water deionization solutions that work. Water Deionization Systems employ an ion-exchange method to achieve high resistivity water via separation, purification and decontamination of input water. Deionization is a process that involves water flowing through beds of ion-exchange resin (usually composed of polystyrene sulfonate), in an effort to separate contaminants and pure water. Two kinds of commercial ion-exchange resin exists; strong–acid Cation and strong-base Anion. In Water Deionization Systems, Cation resin beds serve the purpose of replacing Cations from the feed water with Hydrogen ions. Cation resin beds are charged with a strong acid, usually Hydrochloric Acid, and thus are saturated with Hydrogen ions. When Cation-containing water flows over the resin, an ion-exchange takes place, and hence the name of the process. Anion resin beds, in contrast, are charged with Caustic Soda, or Sodium Hydroxide, and take part in the process of anion ion-exchange. Water Deionization Systems use these resin beds to replace anions in the intake water with Hydroxyl ions from the resin. This is a technology that purifies water, because it removes unwanted Cations and Anions from the input water, and replaces them with Hydrogen and Hydroxyl ions, which form pure water. Examples of Cations include: Calcium, Magnesium, Sodium, Potassium, Iron and Strontium ions. This is a separate-bed Water Deionization technology, where there exists one column for Cation resin, and yet another for Anion resin. The term ‘co-current’ refers to the fact that both the feed water and regeneration chemicals flow in the same direction, usually from the top of an ion-exchange column to the base. There are obvious drawbacks to this process, namely a lower product quality due to relatively earlier exhaustion of regeneration chemicals in the first portion of the column during regeneration. Counter-current Deionization, much like Co-current Deionization, is also a separate-bed Water Deionization technology. Again, similar to the aforementioned process, Counter-current Deionization takes advantage of water flowing through separate columns of Cation and Anion resin. The main difference between Counter-current and Co-current Deionization is that the chemical regenerates flow upwards, while the water flows downwards through the resin columns, thereby enhancing the efficiency of the technology. Less time and chemicals are needed to regenerate the system using the Counter-current Deionization method. This leads to a reduced operation cost, and is a preferable option for clients in the industry. Water Deionization Systems that utilize Mixed-bed technology are comprised of a singular tank with a mix of both Cation and Anion resin. Having both resin types in the same tank allows a much greater amount of ion-exchange to take place per cubic foot, and this significantly enhances the efficiency of the Water Deionization process. More than 25 Years of Industrial and Commercial Water Deionization Experience.